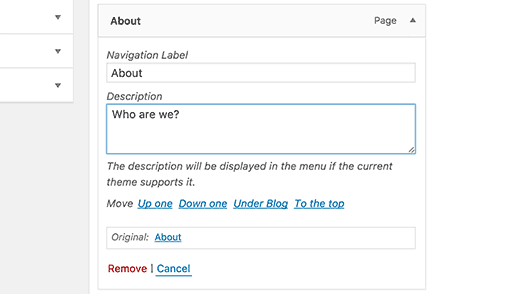 WordPress menu system has a built-in feature where you can add descriptions with menu items. However, this feature is hidden by default. Even when enabled, displaying them is not supported without adding some code. Most themes are not designed with menu-item descriptions in mind. 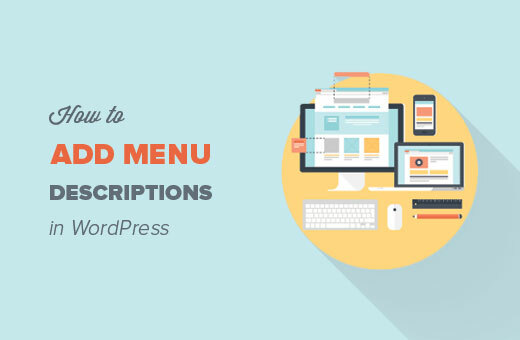 In this article we will show you how to enable menu descriptions in WordPress and how to add menu descriptions in your WordPress themes. Note: This tutorial requires you to have fair understanding of HTML, CSS, and WordPress theme development. When and Why You Would Want to Add Menu Descriptions? Some users think think that adding menu description will help with the SEO. However, we think that the main reason why you would want to use them is to offer a better user experience on your site. Descriptions can be used to tell visitors what they will find if they clicked on a menu item. An intriguing description will attract more users to click on menus. Go to Appearance » Menus. Click on Screen Options button at top right corner of the page. Check the Descriptions box. 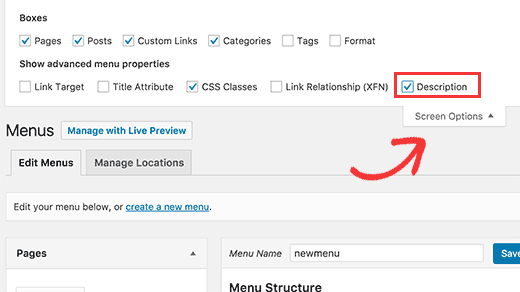 Now you can add menu descriptions to items in your WordPress menu. However, these descriptions will not yet appear in your themes. To display menu descriptions we will have to add some code. Walker class extends the existing class in WordPress. It basically just adds a line of code to display menu item descriptions. Add this code in your theme’s functions.php file. 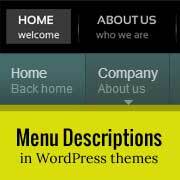 WordPress themes use wp_nav_menu() function to display menus. We have also published a tutorial for beginners about how to add custom navigation menus in WordPress Themes. Most WordPress themes add menus in header.php template. However, it is possible that your theme may have used some other template file to display menus. What we need to do now is find wp_nav_menu() function in your theme (most likely in header.php) and change it like this. In the first line we set $walker to use walker class we defined earlier in functions.php. In the second line of code, the only extra argument we need to add to our existing wp_nav_menu arguments is 'walker' => $walker. To change how your descriptions appear on your site, you can add CSS in your theme’s stylesheet. We were testing this on Twenty Twelve and used this css. We hope that you will find this article useful and it will help you create cool looking menus with menu descriptions in your theme. Questions? Leave them in comments below. Can this work with the WP_Bootstrap_Navwalker ? as i’ve tried it and it breaks my site…. how to turn off the description in mobile layout? How to add title category, not using title category description ? Great Tip but in menu description it does not support html tags. can anyone know about this? Any ideas how to allow html tags in the description? this one not work for me. @Iryna: Can you post your code somewhere e.g. pastebin.com. Where you call remove_filter() will determine whether it works – it has to be called after the add_filter() call. Calling it just before the wp_nav_menu() call might work. Is there anyway for the description not to be hyperlinked? thanks…it worked. but in menu description it does not support html tags.
? And just as with the plugin wpml? Thank you, this was really helpful to just copy paste this and get the quick picture. Hey man, I added the walker class to functions.php, but I cannot find the wp_nav_menu in genesis theme. What am I missing? I have no idea what to do next?!?! You expain very well – detailed and clearly. 1 minute and menu items descriptions are ok. Thank you! Thank you so much for this tutorial. It was recommended to me and it worked perfectly for making the changes I wanted to make. However, in making these changes, I’ve lost my drop down sub-item menus. Any idea what affected that in the code change? It seems like a CSS issue, we are sorry we couldn’t be more specific. Try using Google Chrome’s developer tools to debug it. I have implemented the menu descriptions and it worked great. Now my client is asking for a line break within one of the descriptions. I have tried putting a carriage return and inserting a tag into the description field through the admin. It doesn’t appear in the front end. WP removes these edits. Is there a way to remedy this? If your client just wants spacing then you can use CSS for that. The client wants a line break. Is there a way that I can insert a tag in the description? If I put one in now it gets removed. Great tutorial guys, just want to know how to implement this on a custom menu displayed using the Custom Menu widget? Thank you! Been working on WordPress for years and I’ve never even heard of this before. I was looking to remove the descriptions as they were very redundant on the site I’m working on. I looked everywhere for where they were coming from. and find replace $item with $object. Perfect. This was just what I needed to finish up on a site. I had some issues with the CSS, but I finally figured it out and got it working. Thanks for the great articles. This worked perfectly for me. The class function is perfect too. Thanks a lot! I needed to create same thing and I was totally lost. I was planning to do some stupid things to get this thing done. thank god I found this post and saved time and stress! I simply love this site got to know so much things. Thanks you so much for showing the easiest things here. The span tag is coming on sub-menus too. its not showing there but it is taking that much of space which makes it look too odd. is there any workaround for the same?? This is really a great tutorial and I was wondering if this would work on the Thesis 1.8.5? If not, it would be great if you can provide one. I will most certainly help you put it out there. Thumbs up! I followed your tutorial and added description to my menu. Thanks! However, when I am in mobile mode menu converts into dropdown menu and menu title and description are connected. For example, if my menu item is “about” and description “more about me”, the mobile version shows “aboutmore about me”. Is there a way to fix this? I had the same problem. Here’s what I did. Not sure if it’s the best solution, but it worked for me. Thanks guys, I ran into what SVET and DAVID did with the mobile menu. The code seems to have changed my change was simply appending in a span with the dash seperator and in my desktop query simply suppressed it as was unneeded there. Hope that helps, handled my issue nicely. Great post – very clear, exactly what I needed and worked perfectly. Thank you! I was stuck with the styling-how do I reduce the space between the Main Menu Label and the description? Your help is greatly appreciated. It has to do with the line-height of your .menu a class of your theme. If you reduce that, then the spacing will reduce itself. Great post. I’ve tried to dig into this before but the previous instructions I found were not this easy to follow. I was able to drop the functions.php code in, figure out how to change the walker class in my header file (different for the theme I use, but straight forward), and get things going in about 15 minutes from start to finish. One piece that you might want to add is how to include the right border on the last menu item using the :last-child property. Instead of extending Walker_Nav_Menu it would be nice (and easier) if a filter was provided e.g. Great info … going to start adding this to my sites. Thank you!